Knowing where you are now is the first step to a brighter tomorrow. Real-time Energy Monitoring System is increasingly being used as a critical element of many robust energy management programs because it makes this otherwise invisible energy, now visible and thereby, manageable. Real-time monitoring does what a utility bill can’t... it shows you exactly where your energy is going, second by second. Make a change and it will reveal the immediate effect... for better or for worse.The information is displayed in a language you will understand, be it kW’s, Cost or Carbon. Now you can monitor individual pieces of equipment, isolate energy leaks, expose energy abusers and even check the effectiveness of energy saving products... all in real-time. Features : An Energy management system must be. Beacon specializes in the Eniscope Energy Monitoring System solution. It comprises of a flexible range of web-enabled class-1 digital meters in one, four and eight way configurations, coupled to a bespoke computer interface that disaggregates and processes data on your energy consumption second-by-second.Real time monitoring combines world-class metering technology with an advanced energy network controller; putting live readings and real-time graphical logs within reach, 24 hours a day, from your desktop, laptop or mobile phone. HVAC- Condenser Controller is an internationally patented, passive dynamic condenser controller. It reduces the energy consumption by a minimum of 20% and will improve the reliability of your HVAC system.The product retrofits onto existing equipment, have no moving parts. Solar Hybrid Air Conditioners out perform all the traditional inverter type systems on performance and running costs saving you up to 50% in power consumption. Hybrid solar air conditioners are the next generation in the development of energy efficiency.A hybrid solar air conditioner works with solar energy and conventional energy. Electricity costs is reduced by 30% up to 70%.  Helps to improve their Energy Efficiency.  Achieves average energy savings of 10 to 35% resulting in a short payback.  Is an excellent alternative to an expensive new system.  It is engineered and manufactured in Europe to the highest quality and International Standards. Thermal Insulating, Stain Resistant Elastomeric Waterproofing Paint for Horizontal or Inclining Exterior Surfaces. Poorly insulated roofs are the major source of heat transfer in building structures. This results in large amounts of energy to be required for cooling in the summer or heating in the winter. Energy Saving Roof Paint is a high quality elastomeric acrylic paint with thermal insulating properties, ideal for exterior use in horizontal and inclining surfaces. It contains special nano and micro-sized thermal insulating materials contributing to energy savings. The thermal insulating particles block heat transfer, reflect thermal radiation, and create a moisture barrier that can result in significant energy savings. Excellent durability to UV radiation and alkali. Energy Saving Roof Paint forms an impermeable and elastic film of excellent adhesion, which retains its elasticity even under very low temperatures. It is resistant to adverse weather conditions and has long lasting durability. Its fluoropolymeric composition make it dirt repelling and easy to clean. Energy Saving Roof Paint conserves energy by reflecting thermal insulation, “blocking” thermal transfer and eliminates water permeability of exterior surfaces. It has low dirt pick-up and offers complete waterproofing.Conserves energy, Blocks Heat, Reflects 94.8% of IR radiation, Creates a watertight film, Exceptional elasticity and substrate adhesion, Excellent gap bridging, Withstands ponding water, Excellent opacity and coverage, Excellent durability to UV are few of the many benefits. Air-Con Energy Saver: Click for More Info. "Let there be Light" - We say "let's make it sustainable." LED Lights is the most efficient way of illumination and lighting, with an estimated energy efficiency of 80%-90% when compared to traditional lighting and conventional light bulbs. This means that about 80% of the electrical energy is converted to light, while a ca. 20% is lost. Performance and reliability with accurate colours are the key characteristics while reducing maintenance costs and energy consumption.Long life, Energy Efficiency, ecologically Friendly, Durable Quality, Zero UV Emissions, Design Flexibility, Operational in Extremely Cold or Hot Temperatures, Light Dispersement Instant Lighting & Frequent Switching, Low-Voltage are few of the many benefits of LED Lights. Solar Energy is the energy received from the sun that sustains life on earth. For many decades solar energy has been considered as a huge source of energy and also an economical source of energy because it is freely available. However, it is only now after years of research that technology has made it possible to harness solar energy and to direct it towards conservation of the more commonly used Non Renewable Sources of Energy. Solar Energy is already being successfully used in residential and industrial settings for cooking, heating, cooling, lighting, space technology, and for communications among other uses. With fossil fuels making major impact on the environment and raising issues of pollution and global warming, solar energy has increased in its importance to industries and homes. While the reserves of fossil fuels are restricted, there is no limitation to the availability of solar energy. In the last few years, the cost of manufacturing of photo voltaic cells has gone down by as much as 5% in a year and the percentage of government subsidies have gone up. This means that every year, it is becoming more and more affordable to use Solar Energy. In 2004, the global solar cell production increased by as much as 60%. The amount of energy released by a single Kilo Watt of solar energy unit is equivalent to burning as much as 76 Kg of coal that releases over 135 Kg of carbon dioxide. As per energy industry giant, Shell more than 50% of the global energy in 2040 is going to be in the form of renewable energy. The reason why the GCC countries have been increasingly adapting themselves to Solar Power is because these countries have almost 360 Solar Days - which means abundant supply of Solar Energy throughout the year. Shadow Free Areas and massive landmasses add to the advantage. With Oil prices fluctuating and the world realizing the effects of Global Warming, the GCC countries are fast moving in to capitalize the capacity and advantage of Solar Power System. Due to the movement of manpower from all over the world into the GCC countries and especially the UAE, the high demand for electricity is consistently rising. This growth of infrastructure and manpower has forced these countries to think beyond conventional modes of power generation. This is where Solar Energy, Solar Power and the installation of the entire Solar Power System comes into play. To make sure that the right amount of energy is supplied in order to handle the demand for electricity and power. The power of a PV cell is measured in kilowatts peak (KWP). That's the rate at which it generates energy at peak performance in full direct sunlight during the summer. PV cells come in a variety of shapes and sizes. Most PV systems are made up of panels that fit on top of an existing roof. By avoiding costly trenching, wiring and electrical connection, our solar lights can be installed for less than the cost of traditional systems.Solar powered lighting are the reliable, renewable and remarkable way to light outdoor space.Whether to enhance security, improve commerce or create visibility, Solar lights offer an economic and environmental choice for you parking lot, roadway, path, academic campus, villas,retail or corporate complex, bike trail, pavilion or fence line. Each system features an integrated or Separate Solar array and fixture mount for quick assembly.It is economical, easily installed lighting solution. Solar Water Heating (SWH) is the conversion of sunlight into renewable energy for water heating using a solar thermal collector. 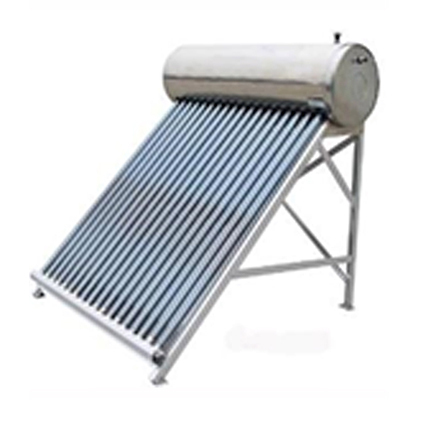 Solar water heating systems comprise various technologies that are used worldwide increasingly. In a "close-coupled" SWH system the storage tank is horizontally mounted immediately above the solar collectors on the roof. No pumping is required as the hot water naturally rises into the tank through thermo siphon flow. In a "pump-circulated" system the storage tank is ground- or floor-mounted and is below the level of the collectors; a circulating pump moves water or heat transfer fluid between the tank and the collectors. SWH systems are designed to deliver hot water for most of the year. However, in winter there sometimes may not be sufficient solar heat gain to deliver sufficient hot water. In this case a gas or electric booster is used to heat the water. A Solar Water Geyser collects heat from the sun and transfers that heat to a stored water supply. A solar water heater can save money and energy-since the fuel source is both free and renewable. · Applications: Homes, Hotels, Hospitals, Hostels, Guest Houses, Process Industries etc.